Welcome to The Park at Forest Oaks Apartments, the premier, affordable apartment community in the bustling Southern metropolis of Tulsa, Oklahoma. Set among a lush, park-like setting in the prominent Kensington neighborhood, The Park at Forest Oaks offers spacious one and two bedroom apartment homes that boast a continuous rhythm of energy and style. Our goal is to provide our residents with amenity-rich contemporary living and an endless supply of entertainment opportunities–all at an affordable price. At-home chefs will appreciate our fully equipped kitchens that branch off into comfortable dining room spaces, which are perfect for entertaining your guests. After dinner, step out on your private patio or balcony for a breath of fresh air. Explore our community at large and indulge in our sparkling swimming pool, exclusive fitness center, and professional business center. Our award-winning management team invites you to tour The Park at Forest Oaks Apartments in Tulsa, Oklahoma. Just minutes from the Arkansas River and Helmerich Park, The Park at Forest Oaks Apartments is located near the best dining, shopping, and entertainment in the beautiful, natural setting of the Kensington neighborhood. We also feature close proximity to Oral Roberts University, making our community a great location for university students and staff. If you have an insatiable thirst for knowledge, you will love nearby Jenks City Library and Barnes & Noble. Prefer to dine out? Hebert’s Specialty Meats, India Palace Restaurant, Sushi House, and Eritrean & Ethiopian Café are in the immediate area and will satisfy your every culinary craving. When you live at The Park at Forest Oaks Apartments, you can start your day with a walk to Starbucks on East 71 Street and enjoy a searing hot latte. 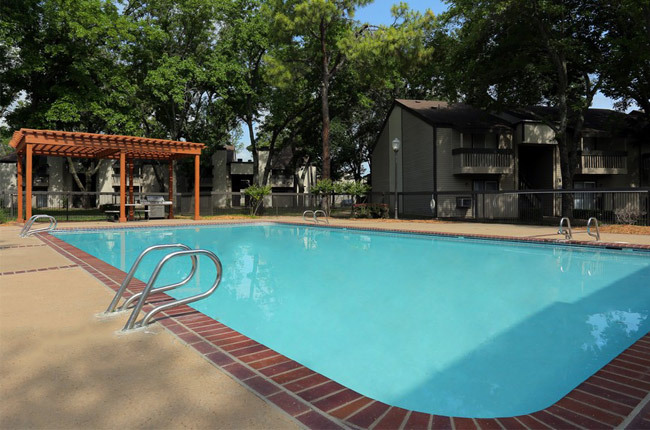 With convenient access to everywhere you want to be, you will enjoy life at The Park at Forest Oaks Apartments.